As I fly out of Anchorage this evening, the view from the window is spectacular! 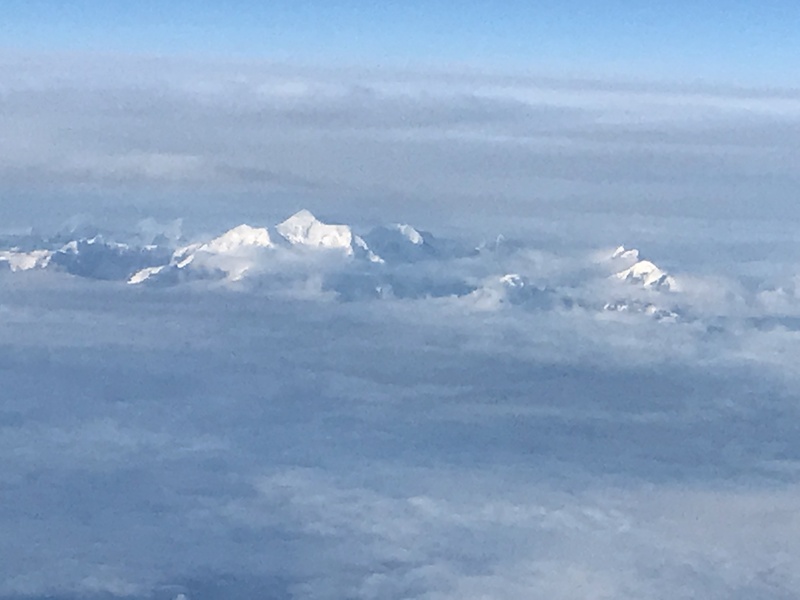 It is a gorgeous evening here, and as the plane climbs, we leave the Cook Inlet behind, and begin to enjoy the vista of the mountains, the snow caps, quickly revealing glaciers. In short order, we are following the coast of the Pacific Ocean as it gently caresses the shores of Alaska. Since I am destined for Louisville, Kentucky for some time with brother bishops over the next few days, I am transported by this scenery to the shores of the Sea of Galilee. I am reminded of the conversation with Archbishop Sambi, Apostolic Nuncio to the United States at the time, when he called me nearly nine years ago to tell me that Pope Benedict had appointed me a Bishop. As part of his ‘wind up’, Archbishop Sambi told me he had just returned to the United States from Israel. He spent time walking along the shore of the Sea of Galilee, reflecting on the life of Jesus; how he called those first Apostles to follow him. Next, he told me: “When you were ordained a priest, you promised to follow Jesus. Now, he is asking you to follow him as one of his apostles.” Since that day, the Lord asked me to keep following him, all the way to Alaska. My friends, each bishop of today is a successor to the Apostles. In the words of St. Paul in the introduction of several of his letters: “I, Paul, an Apostle of Jesus Christ, by the will of God …” These words speak to the heart of every bishop today. We are who we are by the will of God, as successors to the Apostles. I take this responsibility more seriously today than any other day in my life as a bishop. On this Feast of St. Augustine, another ‘brother bishop’ in the long line of Apostolic succession, I find myself reflecting more and more on the ‘face of Jesus.’ The image of Jesus that comes to me often in this ‘summer of discontent’ is Jesus walking ahead of me (appropriately!) with his face turned over his right shoulder looking at me. It is as if He is asking and saying: “Are you coming? Stay close.” Just the sight of Jesus fills me with peace. His face comforts me as I / we struggle and address the challenges of today. As I look forward to time in prayer and fraternal support with some of my brother bishops in the days ahead, I want this readership to know that your bishops ARE turning to Jesus. This is not in any way meant to trivialize the serious demands of our episcopal responsibility to all of you and the needs for reform. Nor is it meant to distract from our priority as bishops to accompany those who have been abused by clergy. It is to reassure you that your bishops are praying, turning to Christ, seeking the grace and inspiration of the Holy Spirit, (the grace of our episcopal consecration) and joining with all of you in our cries to heaven for guidance. I remember in 2002, when the clergy abuse scandal came into the light of day, a priest from the Archdiocese of Indianapolis shared with me that it would take generations for the Church to recover. His words have proven to be prophetic. However, on this glorious day as I depart Alaska, I also have a sense that the Dawn from on High, Jesus Christ, is breaking into the darkness of this moment. One lesson we are learning now is that we should not seek to ‘close this chapter’ in the life of the Church, because this chapter never closes for the victims of clergy abuse, and they need us to accompany them. Those who have yet to come forward and tell their story need to know that we want to hear them, accompany them, and help them on their path of healing. As I said in my homily during the Prayer Service for Healing: “We need one another.” To use an old Latin phrase: Oremus pro invicem; Let us pray for one another.